I was very happy to be able to attend this conference – a day-long marathon on November 24th with a packed schedule, from 9:30 am to about 8:30 pm – because of my (and Feasta’s) strong and long-running interest in monetary system reform. We consider this vital to stabilising the economy and achieving greater social justice – and also, equally importantly, for helping to reduce the extreme pressure that the economy is putting on the environment. The river Main is wide when it goes through Frankfurt and there are a lot of bridges over it, some of which had to be rebuilt after the war. Apparently it’s considered by some to be a border between Northern and Southern German dialects and cultures (jokingly referred to as the ‘white sausage equator’), though others insist that that’s actually the Danube, further south. 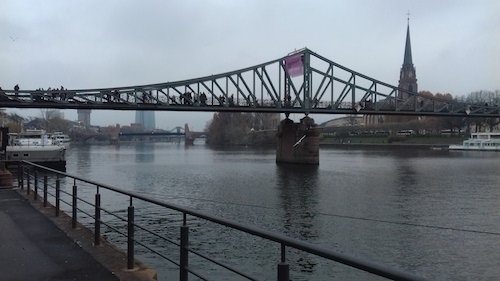 A much-loved iron footbridge over the Main, called the Eiserner Steg, with crowds of people using it on Sunday morning. The pink sign reads “respect: stop sexism”. To add to the ‘crossroads’ feeling of Frankfurt, half of its inhabitants aren’t from Germany, including a fair proportion from Global South countries. Frankfurt is also the place where Goethe grew up. He would go on to write Faust, the famous, and decidedly odd, tragedy about debt. Nowadays the town itself seems a strange mix of rebuilt medieval houses full of souvenir stands (displaying, curiously, a great many postcards of the city immediately after the war, when much of it was rubble), pleasant 19th-century apartment neighbourhoods with lots of green space and playgrounds, big city-centre shops in rather drab modern buildings, and skyscrapers, mostly clustered together in one area, including a couple of massive towers belonging to the highly dubious Deutsche Bank. I hadn’t visited a German city for over a decade and could see that some effort is being put into the energy transition (‘Energiewende’): rental bikes scattered all over the place (mostly in good condition), car sharing schemes, solar panels, and various other little details such as signs in cafés asking you to take reusable cups away with you (they can be deposited in a network of other cafés around Germany). The European Central Bank’s skyscraper is separate from the others, further up-river, and has a tilt, rather to the embarrassment of an Austrian participant in the conference, who explained to me that it had been designed by architects from his home country. For him, its unstable-looking design all-too-painfully symbolised the monetary system it’s supposed to be maintaining. I had some expectations about this gathering and was very curious to see if they’d be fulfilled. By and large, they were, but there were some surprises too. Unless I’m missing something, it seems that there was no one else there from the ECB staff – no one else out of its hundreds, if not thousands, of employees – despite the fact that their headquarters was very close by. This seminal conference which explored core aspects of the ECB’s remit apparently was pretty much off the ECB’s radar screen. – two of the other central bankers who were at the conference – Michael Kumhof from the Bank of England, and Carl Claussen from the Swedish Riksbank – spoke articulately about the possibility of introducing a debt-free digital currency that would be issued by the central bank and that (they argued) would complement the privately-issued bank money, but neither of them gave an exact timeline for when they might introduce this currency, and Dr Kumhof wouldn’t even say that they were considering introducing it, only that they were investigating it. This is very predictable, as one of central bankers’ current roles is to do PR for the private banks. If they were to come out and say “on January the first we’re going to launch our digital currency”, that might make people think “uh oh, the central bankers for this country have no confidence in the private banks. We’d better get our money out of there quick.” Then there would be a bank run, probably accompanied by some equally destructive speculation on the country’s currency. Obviously, this isn’t something anyone wants (apart from some of the more sociopathic financial speculators) – hence the judicious and tentative language. I was very pleased to get the opportunity to see Dr Kumhof speak as he’s a clear thinker and the co-author of a 2012 IMF Working Group study which – much to the astonishment of monetary reformers at the time – endorsed 100%-reserve-backed bank money (not exactly the same thing as Positive Money is proposing, but fairly close). – Dr Claussen from the Riksbank also spoke about the fact that the use of cash is declining rapidly in Sweden, and since the central bank is supposed to ensure that there’s a viable payment system, the Riksbank considers it part of their remit to provide an alternative to cash. I should mention here that there’s a cynical interpretation of the ‘state-issued-digital-money-as-replacement-for-cash’ proposal: it could be that the elite in general sees monetary reform primarily as a way to get more data on citizens, via a digital currency, and thus gain more power over them. This isn’t something to be dismissed as sheer paranoia – we all know by now that the reach of Big Data shouldn’t be underestimated. Indeed, one of the parallel sessions on the conference was on exactly that topic, and I was sorry to miss it. (You can read the paper by Norbert Häring here). – A witty take on the relationship between bank money, central banks and a potential central bank issued money came from the Danish sociologist Ole Bjerg, who compared the current set up between private banks and central banks to a shaky marriage. He argued that Positive Money would lead to the privatization of the banking system (currently propped up by many hidden subsidies, and prone to corruption) and the socialization of the payment system. – there was much enthusiastic discussion of blockchain and its potential – apropos of replacing cash – to allow for anonymous transactions. One speaker, Veronika Kütt from the Frankfurt School Blockchain Center, made a vivid comparison between the monetary system now and the media twenty years ago. Just as the internet has completely transformed the media, she believes that blockchain will radically transform the global monetary system. – from looking at the programme I could see that there was no planned discussion about the environmental impact of the debt-based money system. While Steve Keen, who also made a presentation, has commented elsewhere on the absurdity of ignoring the role of energy in mainstream economic models, it didn’t come up in his talk (which was cut short because of time constraints). The overall emphasis in the conference was firmly on financial and social impacts of money, apart from some brief – but relevant – mention of the ecological footprint of Bitcoin. More about this below. – there was a fair bit of quibbling among the speakers about the details of monetary reform: should the new currency always be convertible with bank-created money; should it be integrated with existing central bank reserves; should interest be set on it; should competing private currencies (including bank money) be allowed; should negative interest be allowed. This is all to be expected from something that’s still relatively unexplored. – an excellent presentation by Emma Dawney and Maurizio Degiacomi of the Vollgeld campaign – the campaign behind the recent referendum for Sovereign Money in Switzerland, which got 25% of the vote – mentioned that in a survey held after the referendum, 60% of Swiss citizens surveyed thought that money is currently issued by central banks, not private banks. This was despite just having voted on the proposal that money *should* be issued by central banks, not private banks. Moreover, 80% of the people surveyed said that they thought money *ought* to be issued…..by central banks. While I can think of some other examples of rather strange voting patterns in various countries in recent years, I think the Vollgeld referendum, in its modest, low-key way, is a clear victor in terms of demonstrating just how confused an awful lot of people are about what’s really going on in the world. – in a similar but still more troubling vein, I heard from various Positive Money activists from different countries that quite a lot of central bankers are still convinced that private banks don’t actually create money, but just act as intermediaries between borrowers and savers (the classic and completely misleading standard textbook explanation). This is despite the fact that last year even the conservative Bundesbank came out with a clear statement that private banks create money. I don’t know whether to laugh or cry about the apparent ignorance of a lot of the people who are supposed to be regulating the financial industry as to how the financial industry actually functions. – quite a few of the central bankers stayed all the way through the conference and listened in on the sessions about Positive/Sovereign Money and blockchain. To reiterate: I don’t expect them to publicly and enthusiastically endorse full monetary reform but I think it’s a good sign that they seemed interested in knowing more about it (though we should also keep in mind the ‘Big Data’ angle mentioned above). – despite what I wrote further up about PR, some of the central bankers were much more militant than I expected, roundly criticising the current system’s constant recreation of debt bubbles and saying that other approaches need to be readied for implementation when (not if) the next crash happens. One of them, the former governor of the Bank of Spain, MIguel Ordoñez, was very explicit in his support for Positive Money (and again, I’m not convinced that he was personally interested in data mining. He seemed more interested in doing something along the lines of the Peel Act – a 19th century British law which forbade private banks from issuing their own cash banknotes). Another, William White, gave a comprehensive overview of things to worry about in the current global financial system. Suffice to say that there are plenty of them. – a former Deutsche Bank, IMF and Goldman Sachs employee, Thomas Mayer, spoke eloquently about how the Eurozone is really only a cash union and how, if there’s a bank run in Italy and Italians trying to bring cash to Germany are stopped at the border, that will effectively mean the end of the EU. His solution was to introduce safe, central-bank-issued money, and to bring the Germans and other northern countries on board by also allowing for competition between different kinds of money (I’m unclear on how this would work for, say, paying taxes. He also didn’t address the ecological angle – but then, hardly anyone does). – There were far more young people at the conference than I expected. (I’d thought it would be too expensive for students to attend, but in fact they were able to get in at a reduced rate). I was extremely heartened to see this, partly because it’s incredibly important to get young people’s voices heard about what is, after all, their future, and partly because they were obviously so interested in the topic. – there was a strong and very positive reaction to a question that I asked early on in the conference about the environmental impact of the financial system. I was afraid that I’d messed up my chance to ask about this, as there was some confusion at first about what I was asking and the speaker didn’t have a chance to answer me in much depth because of time constraints. However, during the coffee breaks and other pauses, quite a range of people from different backgrounds brought it up with me spontaneously. They included a couple of the central bankers, one of whom was also a keynote speaker. Without exception, they all said they understood the point I was making and that they thought the link between debt-based finance, growth and the environment went ‘deep’ (as one of them put it). Some of them said that they thought it was the most important issue raised in the conference. The keynote speaker added that the money-growth-environment link had never occurred to him before. This drives home to me that (a) this topic badly, badly needs to be discussed far more and (b) there’s an enormous potential for it to become a lever for real change. I’m convinced that the monetary reform movement would make considerable strides if it put more emphasis on the ecological effects of money. Positive Money (in the UK) has got off to a decent start earlier this year with its ‘Escaping Growth Dependency’ publication, but there’s still plenty more that can be said. It’s an exciting topic. – From talking to the other attendees I got the impression that there was a distinct cultural generation gap, in terms of attitudes about progress and the most important things to prioritise. Many of the older people there seemed to assume that the growth-based economy derives, purely and simply, from basic human nature; as one of them put it (I’m paraphrasing as I don’t remember his exact words), “economic and social needs make us always wish to generate profits and consume more”. While nobody denied the urgency of the environmental crisis, I had a sense among some of the older people (though thankfully not all) that it was just too painful for them to look at closely – their expressions would immediately become dismayed if you brought it up. The younger people, while not blasé at all about the situation we’re in now, gave me the impression that they’re far less sold on the idea that we need growth in order to satisfy innate and universal human needs. For example, some young economics students who I assumed would be completely neoclassical in their thinking had in fact attended the Leipzig Degrowth conference and were totally on-board with the idea of degrowth, as were various other random people I talked to, including several ’techies’ (of whom there were quite a few because of the blockchain theme). As my colleague Graham Barnes points out, the issue of how currency should be introduced into the economy is key to economic and social stability. We don’t want to end up replicating the power inequalities and rocky investments that we already have. As implied above, the line that most speakers took on this was that a central bank digital currency would either complement or completely replace existing bank deposits. This would be different from the current system of letting banks decide how much money to create and for whom, and it would also give people the option to put their money where it is completely safe. (They could also opt to leave their money in the bank, where it wouldn’t be safe, but it might generate more interest.) A couple of participants also mentioned the idea of directly distributing central bank money per-capita (“helicopter money’). This could be done in the event of a crisis, but it wouldn’t necessarily require that. I was sorry to miss the presentation of Edgar Wortmann, a Dutch lawyer, as he went into some detail on how the transition to debt-free money could take place (and made the interesting argument that this needn’t be done by central banks, but could be taken on instead by a new European authority.) His paper is here. As far as steering investment goes, programmes such as Cap and Share (advocated by members of Feasta’s climate group) would help to ensure that money was spent in a way that was constructive and automatically took biosphere limits into account. ‘Robin Hood’-type taxes would very likely help too. 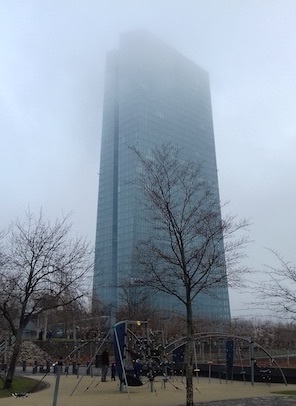 The conference reinforced my impression that it would have been more appropriate to put the European Central Bank building down-river from the other Frankfurt skyscrapers, rather than up-river. European Central Bank. Nice playground in front, but is the bank disappearing into the mist? Central banks are supposed to set monetary policy, but in reality, they’re scrambling to cope with monetary ‘policies’ that are being determined, in a reckless manner, by the private banks and the overall financial industry, and which are having all sorts of destabilising and dangerous effects, with ramifications going way, way beyond the world of finance. The apparently total incomprehension of the system on the part of some central bankers doesn’t help. The morning after the conference I took part in an enjoyable brunch with members of the International Movement for Monetary Reform at a café near the ECB, by the riverbank. The windows of the café looked onto the river, rather than the ECB building. This made me reflect on the fact that the Main’s impact on Frankfurt has actually dwarfed that of the big skyscraper nearby or the other skyscrapers further down-stream. It’s only because of that river that Frankfurt exists at all, and in the years to come we’re all going to be made intensely aware of our dependency on water – both as a component of life, and as a means of transport – and on the other necessities that the biosphere provides for us. While many of the conference attendees, including some of the Positive Money activists, talked about incremental change and the need to introduce reforms gradually, the environmental crises we’re facing have put me in a tearing hurry. Bank runs can be nasty, yes – but not leaving a habitable planet to our children is considerably nastier. The sooner we adjust our cultural and economic assumptions so that they fit in better with that reality, the better for us all. Note: information about the conference and links to many of the papers are here (to see the papers, click on ‘agenda’). The conference was filmed and the videos will be made available on Youtube. Featured image: postcard of the Eiserner Steg, unknown author, 1914. Thanks, Elspeth! I agree with you. I expect you’re familiar already with Lakoff’s writing about strict father/nurturant parenting. (Mike Sandler has his own take on it here: http://www.feasta.org/2018/06/14/fathers-day-thoughts-on-star-wars-religion-and-basic-income/ ). Like you I’m convinced that there’s a link between early childhood experience and later patterns of addiction, including overconsumption: http://www.feasta.org/2011/07/16/is-over-consumption-hard-wired-into-our-genes/ .